For a general overview of the requirements from IBO for the final submission, refer to the Guidance for the development of the internal assessment page of the Computer Science Teacher Support area of the IBO CS portal. As we go through these steps together in class, you should keep a running list in TextEdit or on your phone or some place of the things you need to continue to work on on your own. Check Google doc for completion of all parts & make sure titles for each one. - Make sure you have each of these sections in your Google doc. Students and teachers must insure that the word limit is not exceeded. If a student does exceed the word limit of 2000 words, the moderators are instructed not to read beyond this point. This means students could potentially lose marks from the last sections of the solution, such as criteria C and E (potentially worth 18 marks). Regulations regarding the use of annotations and tables should be closely followed. During the writing of the documentation student should bear in mind the suggested word length for each section provided in this publication. Stephen should include the total number of words on the cover sheet. Is the penalty imposed when a student does not follow the recommendations on the length of the solution? Yes. The maximum word limit for the documentation for the solution is 2000 words. Once a student reaches this word limit no further work will be marked. If forms, tables, bullet points or footnotes are used for extended text (for example, for explanation, analysis and evaluation) thereby trying to exclude from the word count, this text will be included in the word count." And here is the relevant section of the "Guidance for the development of the internal assessment" part of the Internal Assessment Teacher Resource Material on-line document. These word count figures in the table below are guidelines. The overall word limit for the solution is 2,000; however, it is possible to complete the solution in 1,500 words without a significant loss of quality. If students write extended prose in the sections where the word count does not apply, these words will be counted in the overall word count. It is strongly recommended that the documentation is submitted in a commonly used format such as a PDF. Prescribed format(s) of presentation are indicated in bold. Diagrams: Including scanned sketches, lists or concise statements, table for assets and techniques and for test plan. Extended writing: Justification of techniques used, including annotated screenshots and sources where appropriate. Video of product functioning plus, if necessary or appropriate, document including screenshots showing the product functioning should be included in the documentation folder with information on how to access it on the cover page. Assessed through design overview and, where appropriate, code listing. Additional information, such as evidence of consultation with and feedback from the client and/or adviser. Make sure to put a word count for each Extended writing section mentioned above, along with an overall word count at the top of your document. If you are close to the 2000 word limit, you should add the following precautions within your text to make sure the moderator does not count words he/she should not. - To pseudocode sections add a note something like: "(This is pseudocode, and therefore does not count toward the word count.)" - Be careful that you are counting tables and bulleted lists if being used in one of the "Extended writing" sections above. - Think about converting a section or two which is presently narrative into a table or bulleted list - since these take up less words. The one thing you may have included in the word count but you shouldn't is the Success Criteria as long as it's a bulleted list. And note that in Criteria B, nothing at all counts toward the word count. So if after noting these two things, you're still close to or above 2000 words, you'll have to reduce the word count somehow. But the good news is the more you read through what you have written, the more you will realize that you can say what you mean in less words. So take what may very well have come out of your mind like a stream of consciousness at the time of writing, and condense it; it's actually easier than you might think. Keep in mind here an ISB grade is not necessarily directly translatable to a Criterion grade (out of 12, or 5, for example), so you should go back to the IB rubric descriptions right from the IB documentation itself. The idea here is that I have always found that students struggle with producing flow charts of a program during their first real go-around of the software development cycle. And it really is a very useful stage of development, but not necessarily if you have never done it before. So rather than having had you do it as part of stage B or C, I have you leave it until after you are finished. So, yes, this, at this stage, the way we have done things, is backward engineering. But I want you to do it, so that next time you'll know the kind of thing you are trying to achieve. And furthermore, it makes for a good overall communication of your program structure, for the extensibility purposes of either you or another person taking this project, trying to get a feel for it, and developing it further. You can make this more of an algorithmic flow chart, or a data flow flow chart. It's really up to you. What you are trying to show is how your program works, in a symbolic way, that even someone with very limited programming experience could understand. 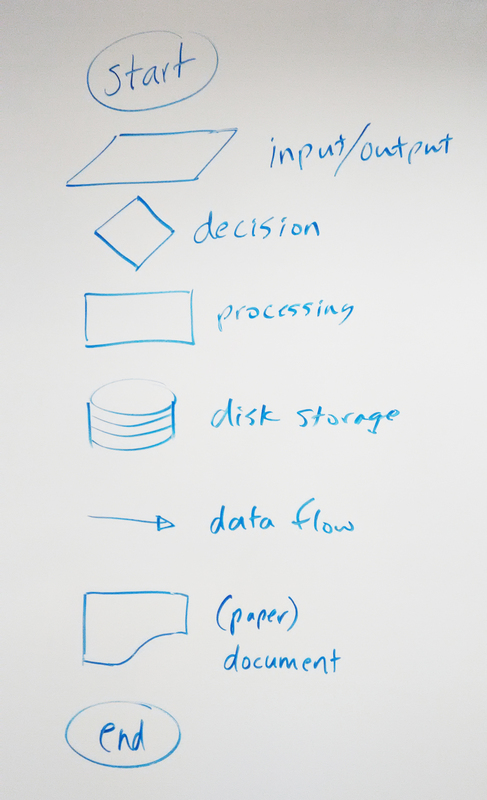 There are somewhat standard symbols for both algorithm and data flow flow charts, but there is also a lot of variety, so I never like to hem students in with this kind of work, rather, using some commonly accepted symbols, you show how you think it makes the most sense how your program works. Below is an image of some common symbols you can use. Simply doing it with paper and pencil, and taking a picture is probably the best, and certainly the easiest, way to do it. I'm not sure this is any more needed, though it used to be required with the former "Dossier" IB CS IA. 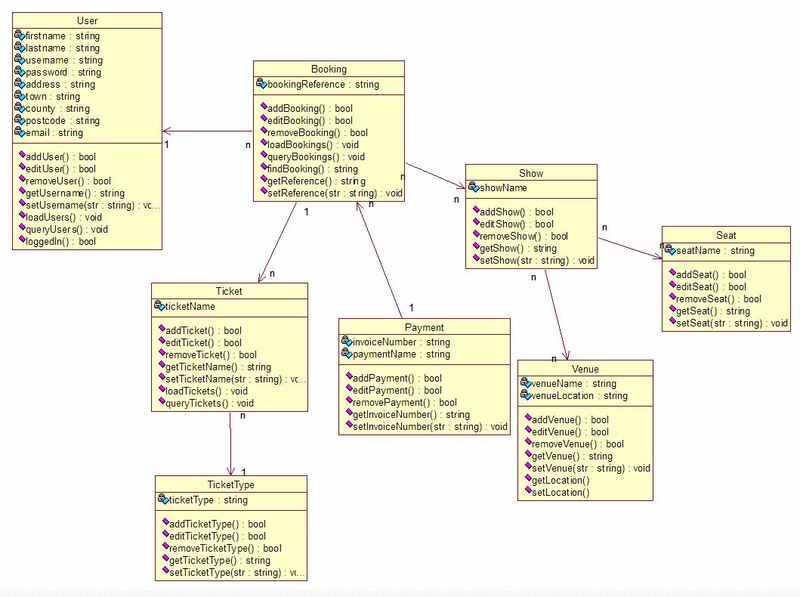 Just like the flow chart above, UML diagrams are a useful planning tool, and you did some basic planning UML class diagrams in your planning stages way back in the beginning of the IA process. But a lot likely changed between then and now. So the same argument can be made to do a "post" UML set of diagrams, just like a post flow chart. They can both be used by either you or another programmer to get a bird's eye view of your project, for extensibility purposes of working on a new tweaked version of the software or a major new release of it, with lots of additional functionality. UML diagrams can be auto produced by a variety of on-line and stand-alone applications, such as Fujaba. You usually just drag your project to the app, and it generates the UML for you. 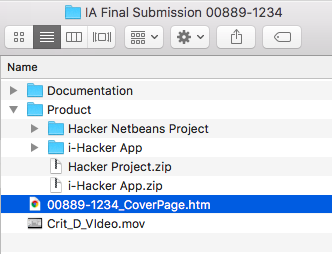 Code listing Appendices - export from Netbeans etc. & fixed up in TextEdit etc. - We will use html pages for the classes in the Appendix, which will be "printed to html" from Netbeans, so there's no need to convert them to pdfs. - If it's no done by default, change the text color of the NetBeans etc. auto-generated code to be block grey or something else we agree upon. - AND DEFINITELY CUT AND PAST ALL OF THE AUTO GENERATED CODE DOWN AT THE BOTTOM OF THE MAIN GUI FILE, so that it is easier to see your own code. - Optionally, you could reduce the size of the Netbeans auto generated code, so it’s obviously smaller, but still able to be discerned, if not terribly easily read. - Make your comments the darkest shade of grey. A. The Netbeans etc. project - All you have to do for this is go File, Export Project to Zip, and then make sure you pick the correct Project Root. B. The compressed "JAR" Java file - Which is effectively the application, and can be run on any computer with a Java Virtual Machine installed. You should change the name of this JAR file to be the name of your application. In Netbeans, Control/right-click on the Java coffee cup project icon in the Projects window, and go to Properties. And for the Main Class field, click Browse, and locate and select the class you know is your main Main (the one with your main GUI). Then Control/right-click again on the project coffee cup icon, and go Clean and Build. When it is finished (check the console at the bottom of the screen), take note where it says the .jar file is (it should be in the dist folder of the project). - Make sure the .jar file is named as you wish your application to be named. - Change the name of the dist folder to be your application name as well. - And you should write something basic about installation in the Read Me file (like "drag this whole folder to your Applications folder, or on Windows the Programs folder). 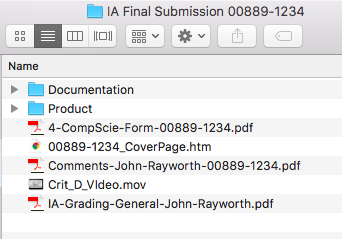 Right-click and compress/zip the folder (formally called dist, now re-named) and move it to your "Product" folder of your "IA Final Submission" submission folder. Hopefully you have kept up with your record of tasks. If not, check at the top of this page for the sections of the IA, and make sure at least each of them is there, with approximate, if not pin-point accurate dates and times. Another place you could look both for completed stages and dates is the Haiku homework submission page. The record of tasks was supposed to have been done using the .rtf template. If you did not use it from the beginning, either transfer things now, or make sure it looks the same and covers the same information. Here is the original Record of Tasks document. Something to think about. If you do, put a descriptive paragraph ahead of it. The following is from IBO OOC (now called something else), modified for on-line uploading (instead of by CD ROM as it used to be done). The product folder should contain a “working” version of the product, in whatever format it is best presented. So for Java programs, it is best to include the product as JAR file, which is the compressed class files that are ready for the Java Virtual Machine to run; so it is for all intents and purposes the application file. 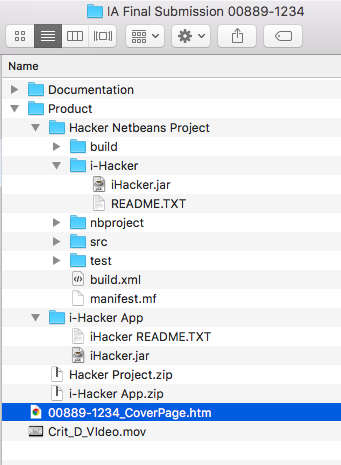 And you should also include the Netbeans project, in case the moderator knows/has Netbeans and wants to did a little deeper into your project. On the other hand, moderators may not have facilities to run all products that is why the video showing that the product functions is required first and foremost. Reminder that the video should be 2-7 minutes long that focuses SOLELY on demonstrating that the product functions (no introductions to the candidate, problem discussion etc.). If it is much longer, examiners might not watch it all. And both .mov and .mp4 video formats are fine. 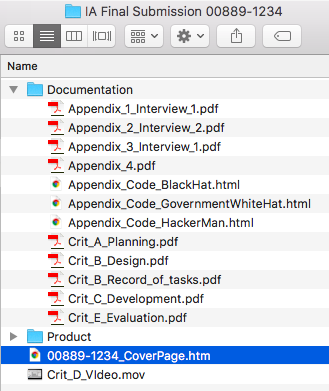 So if you have all your ducks lined up, and - importantly - names of files as the IB suggests, this part is actually not all that painful as long as you're not scared off by the html. Here's the html document to download and open in an html editor. The easiest is to use TextEdit. 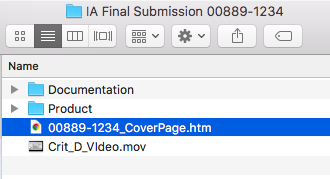 When opening the file, just do so via File, Open (not a double-click), and before you click the Open button in the open dialogue box, click the Options button, and check the "Ignore rich text commands" check box. Then you can edit the html directly. Pseudocode is not counted in the word count.